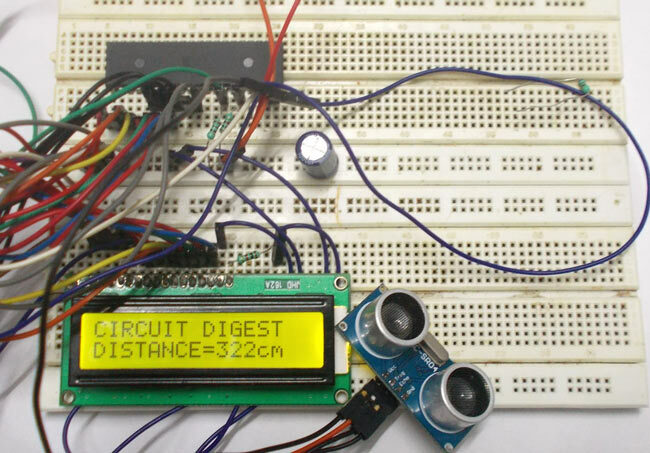 In this tutorial we are going to discuss and design a circuit for measuring distance. This circuit is developed by interfacing ultrasonic sensor“HC-SR04” with AVR microcontroller. This sensor uses a technique called “ECHO” which is something you get when sound reflects back after striking with a surface. We know that sound vibrations can not penetrate through solids. So what happens is, when a source of sound generates vibrations they travel through air at a speed of 220 meters per second. These vibrations when they meet our ear we describe them as sound. As said earlier these vibrations can not go through solid, so when they strike with a surface like wall, they are reflected back at the same speed to the source, which is called echo. Ultrasonic sensor “HC-SR04” provides an output signal proportional to distance based on the echo. The sensor here generates a sound vibration in ultrasonic range upon giving a trigger, after that it waits for the sound vibration to return. Now based on the parameters, sound speed (220m/s) and time taken for the echo to reach the source, it provides output pulse proportional to distance. As shown in figure, at first we need to initiate the sensor for measuring distance, that is a HIGH logic signal at trigger pin of sensor for more than 10uS, after that a sound vibration is sent by sensor, after a echo, the sensor provides a signal at the output pin whose width is proportional to distance between source and obstacle. This distance is calculate as, distance (in cm) = width of pulse output (in uS) / 58. Here the width of the signal must be taken in multiple of uS(micro second or 10^-6). Hardware: ATMEGA32, Power supply (5v), AVR-ISP PROGRAMMER, JHD_162ALCD (16x2LCD), 1000uF capacitor, 10KΩ resistor (2 pieces) , HC-SR04 sensor. Here we are using PORTB to connect to LCD data port (D0-D7). Anyone who does not want to work with FUSE BITS of ATMEGA32A can not use PORTC, as PORTC contains a special type of communication which can only disabled by changing FUSEBITS. In the circuit, you observe I have only took two control pins, this give the flexibility of better understanding. The contrast bit and READ/WRITE are not often used so they can be shorted to ground. This puts LCD in highest contrast and read mode. We just need to control ENABLE and RS pins to send characters and data accordingly. In the circuit you can see we have used 8bit communication (D0-D7) however this is not a compulsory and we can use 4bit communication (D4-D7) but with 4 bit communication program becomes a bit complex. So as shown in the above table we are connecting 10 pins of LCD to controller in which 8 pins are data pins and 2 pins for control. The ultrasonic sensor is a four pin device, PIN1- VCC or +5V; PIN2-TRIGGER; PIN3- ECHO; PIN4- GROUND. Trigger pin is where we give trigger to tell the sensor to measure the distance. Echo is output pin where we get the distance in the form of width of pulse. The echo pin here is connected to controller as an external interrupt source. So to get the width of the signal output, the echo pin of sensor is connected to INT0 (interrupt 0) or PD2. 1. Triggering the sensor by pulling up the trigger pin for atleast 12uS. 2. Once echo goes high we get an external interrupt and we are going to start a counter (enabling a counter) in the ISR (Interrupt Service Routine) which is executed right after an interrupt triggered. 3. Once echo goes low again an interrupt is generated, this time we are going to stop the counter (disabling the counter). 4. So for a pulse high to low at echo pin, we have started a counter and stopped it. This count is updated to memory for getting the distance, as we have the width of echo in count now. 6. The distance is displayed on 16x2 LCD display. BLUE (INT0): this bit must be set high to enable the external interrupt0, once this pin is set we get to sense the logic changes at the PIND2 pin. BROWN (ISC00, ISC01): these two bits are adjusted for the appropriate logic change at PD2, which to be considered as interrupt. So as said earlier we need an interrupt to start a count and to stop it. So we set ISC00 as one and we get an interrupt when there is a logic LOW to HIGH at INT0 ; another interrupt when there is a logic HIGH to LOW. RED(CS10): This bit is simply to enable and to disable counter. Although it works along with other bits CS10, CS12. We are not doing any prescaling here, so we need not worry about them. We are using internal clock of ATMEGA32A which is 1MHz. No prescaling here, we are not doing compare match interrupt generate routine ,so no complex register settings. The count value after counting is stored in 16bit TCNT1 register. Working of Distance Measurement sensor is explained step by step in the below C program. DDRA = 00FF;//Taking portA as output. i use atmega32 with 8mhz crystal frequncy but this code is 1 mhz , so how to change in this code ? If you change the fuse bits of ATMEGA32 already than change the term " #define F_CPU 1000000" to " #define F_CPU 8000000". If you haven't changed the fuse bits, not matter what crystal you attach to the ATMEGA8 , it will work on internal 1MHz crystal. When i - 1, the ISR completes the block for i =1 and then jumps to the block for i = 0 , why is it needed? why isnt it written as an else if block? Your reply would be much appreciated, sir. This is a trick to set a specific bit to 0. The ~ inverts the binary data. You shift a 1 to the left to the position you want (say 00000100 for the third bit). Then you invert the data (11111011) and then you use this data as mask with the & operator on the PORTD register. This will set all the bits to their original value except the third bit, which will always be 0 (BIT & 0 => 0). thank you for the great code, but why don't you use the Input Capturing Pin PD6? At 1Mhz what precision of measuring distance ? 'DDRA ' and 'GICR' was not declared in this scope, having this problem during compiling the code. Include all the libraries properly specifically interrupt.h. Great work thanks Dilip. . .
Where is the lcd library Sir? Thank you for the great work on this tutorial. I am however confused by the use of the 1000uF capacitor...I am afraid I do not understand what it is used for from the circuit diagram. Can you please shed some light on this? Thank you in advance. does it wil work if i simply do not atteche the programer port? Thanks for a kind explanation. The speed of a sound appears 340 meter per sec I guess? COUNTA = pulse/58; may be rewritten to COUNTA = pulse/59? What part of the code connects TCNT1 to the internal oscillator to count? Please explain how INT0 pin can make TCNT1 count. i use ATmega32A... SO how can i change this code? Since the ATMEGA32A and ATMEGA 32 is pretty much similar, I think the code should be the same. How does he program vary if I use an ATmega16 ? Works fine and helped a lot to get it done faster. However I'm wondering weather the ISR is correct. I've the impression that the if(i==0) should rather be an else clause, otherwise the statement is always true and executed, or not? Is there any possible way for this project to connect with buzzer. I have a project using the distance sensor to control the audio tone. What code should I implement into this code in order to allow it to control buzzer? My project is about if the distance between distance sensor and object is lesser from certain distance, the audio tone is lower. When the distance is further, the audio tone is louder.